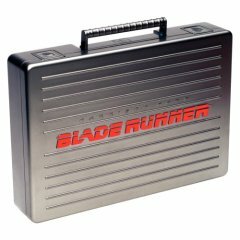 Some of the most exciting news to the ears of movie enthusiasts this year is the upcoming release of the 25th anniversary release of Blade Runner. All the details are now available, and it is quite the treat for fans of this cyber punk, sci-fi classic featuring Harrison Ford. Fans of the film will be pleased to hear the collector’s set will be available on your choice of DVD, HD DVD and Blu-ray Disc on December 18, 2007. The five discs in the set will be jam packed with special features and five versions of the film. Ridley Scott’s all-new “Final Cut” will be the premier showcase on disc one. The “Final Cut” version was scanned at 4K resolution, restored and remastered completely – so we can expect the highest quality presentation available. Ridley Scott has added never-before-seen scenes and extended cuts to this version of the film. In a somewhat controversial move, Warner has added new special effects and an all-new 5.1 Dolby Digital audio track (Blu-ray and HD DVD audio specs are TBA). I’m all for updating movies, but lets just hope they did a good job with it and the elements will not be distracting as we’ve seen with some other movies (*cough*Star Wars*cough*). Disc two will feature an exciting feature-length documentary, Dangerous Days, directed by the award-winning Charles de Lauzirika. This three-and-a-half-hour documentary covers every aspect of the film from its production through it’s history from the perspective of over 80 crew and cast members. On disc three we see three versions of the film. The 1982 theatrical release comes with a Harrison Ford character narration and “happy ending.” 1982 international version, which was previously released to home video, LaserDisc and on cable, is an unrated version featuring some extended action sequences. Finally the 1992 director’s cut that does away with the narration and “happy ending” but adds the “unicorn” sequence. These don’t appear to be getting the remastering treatment, and are added mostly just to have a complete collection all in one box. An Enchantment Archive fills disc four with 90 minutes of deleted footage and never-before-seen featurettes and galleries covering the history, production, special effects, TV spots and much more. Notable pieces include Sacrificial Sheep: The Novel vs. The Film featurette, The Art of Blade Runner gallery, deleted and alternative scenes, and Deck-A-Rep: The True Nature of Rick Deckard featurette. Between the documentary and this offering, we should have everything we ever wanted to know about Blade Runner plus more. To wrap up the box set, we’re treated with a “Workprint Version” which has never been seen outside the studio before. This version is very different than any other version of the film including an altered opening scene, no Deckard narration, no “unicorn” sequence, no “happy ending,” different dialog, music and more. This includes a Paul M. Sammon commentary and another featurette. If all of this is not enough to satiate the collector’s desires, it comes packaged in an attractive Deckard replica briefcase. This should be the definitive Blade Runner collection. All this for the MSRP of $78.92 for the DVD version (of course it’s on pre-order from Amazon for $54.99). The Blu-ray and HD DVD versions may vary slightly from the DVD version, we haven’t got all the details on that yet, and the pricing will more than likely be closer to $100 if not more. EDIT: The list price for the HD DVD and Blu-ray versions is confirmed at $99.98 (I was off $0.02, so sue me). It is available on Amazon for $69.95. Blade Runner is a cult. No matter how many years passed its launch, the movie still blows our mind. This new release seems to be fantastic, but we are in a new era too… must wait for Blue-ray version. This one will be the BR definitively release. By the way, when we will have Lord Of the Rings in Blue-ray? any news? There have been no formal announcements regarding Lord of the Rings coming to either high definition format, but a Microsoft employee has hinted that they were working on the high definition encode.